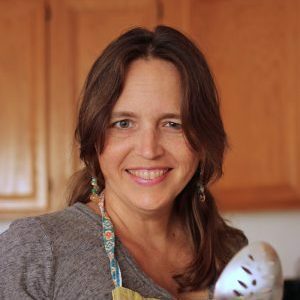 Growing up in Southern California, I lean toward Mexican-American food as my favorite cuisine. Even though my parents were Norwegians and Poles from Minnesota, I was more familiar with a tortilla than lefse or the foods of my forefathers. Without Mexican grandmothers to show us the ropes, FishPapa and I have taught ourselves some things along the way, too, like how to make tamales or homemade tortillas. We leaned on these skills during our stint in Kansas City where we had a really hard time finding California-style Mexican food. Now that we’re back home, we still make these things ourselves, enjoying Mexican-inspired fare almost on a daily basis. Creamy Turkey Enchiladas – the result of a pantry challenge, this recipe comes together with things you probably already have on hand. No canned sauces. Chicken and Chile Enchiladas for a Crowd – if you’re not entertaining a crowd, just freeze the extra pan before baking. 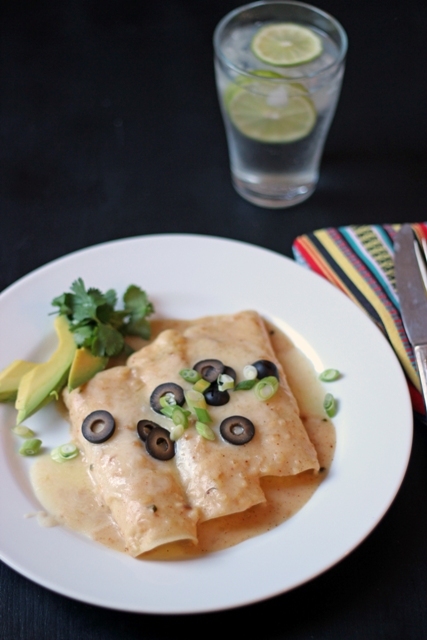 Poblano Chile Enchiladas – Probably one of our family’s favorite meals. We divvy them up even-Steven so no one gets to hog them all. Crockpot Enchiladas – These are super easy to make, and there are never any leftovers. Need I say more? Cheese Enchiladas – These meatless enchiladas come together in about 15 minutes. I now make them with a slightly spicier adaptation of this recipe from Gimme Some Oven. Chili Stacks – This is a taste of my childhood. These stacked enchiladas take 30 minutes from stove to oven to table. You can’t lose. 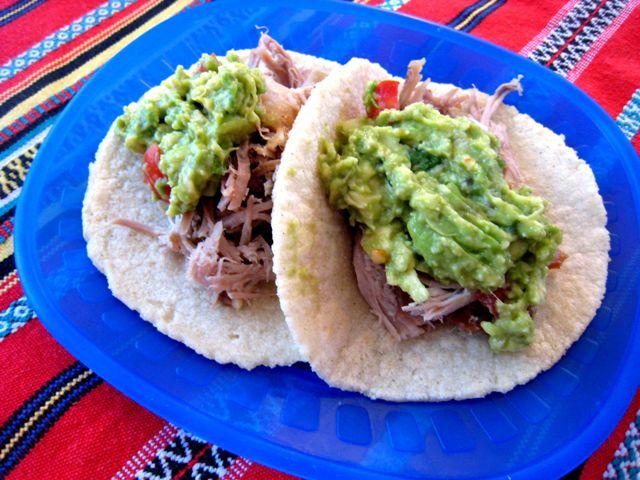 Carnitas Soft Tacos – These are my very favorite kind of tacos. This crockpot recipe will rival whatever you can find at a restaurant. 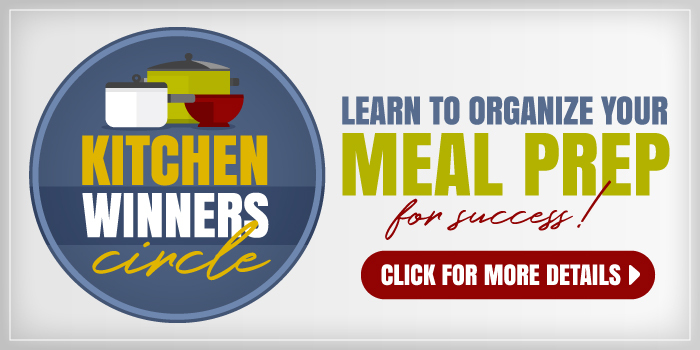 Taco Seasoning Mix – Don’t buy packaged mixes. This is cheaper and better. Paso Mom Tacos – A family favorite at our house, these disappear in a flash. Turkey and Black Bean Tacos – Stretch your taco meat by adding beans to the filling mixture. Santa Fe Chicken Tacos – Got leftover chicken? Transform it into tacos. Grilled Shrimp or Fish Tacos – No need to go to a restaurant. These babies are awesome. Chicken, Bean, and Cheese Burritos for the Freezer – Make several batches and stash them in the freezer. They won’t last long, unfortunately. 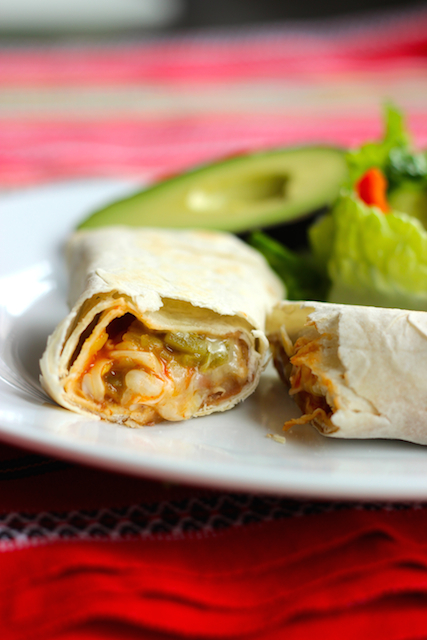 Green Chile Burritos – I love these meatless burritos. They are tasty and full of flavor. Burritos for Freezing – Want some tricks for making tasty frozen burritos. This post of mine at The Kitchn should answer lots of questions. Breakfast Burrito Bar – This is a stick-to-your-ribs kind of breakfast. So delicious! 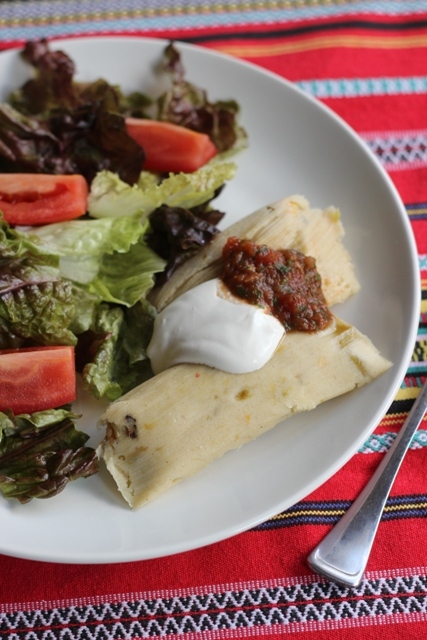 Cheesy, Corn, and Chile Tamales – These are my lazy girl tamales. Jalapeno Popper Nachos – All the flavor of Jalapeno Poppers, but cheaper when the ingredients are dispersed over nachos. So good! Easy Skillet Nachos – This dish is so easy, I created it on vacation with limited kitchen equipment. DIY Nacho Bar – Let everyone dress his nachos the way he likes them. Potato Nachos – Find a sale on potatoes? Make nachos with potatoes as the base. Not Soggy Nachos – My kids have enjoyed these since they were little. No soggy chips! Beef Taquitos – Delicious and crispy, these “tube tacos” are also freezer friendly. Easy Chicken and Cheese Flautas – Typing this list has made me so very hungry! These flautas are absolutely fabulous. Burrito Pizza – Who says pizza can’t be international? Top your dough with burrito fillings for a fun twist. Jalapeno Burn Pizza – This is one of our favorite pizzas ever. So spicy and good! Lawnmower Taco – FishBoy9 says this is his favorite dinner ever. 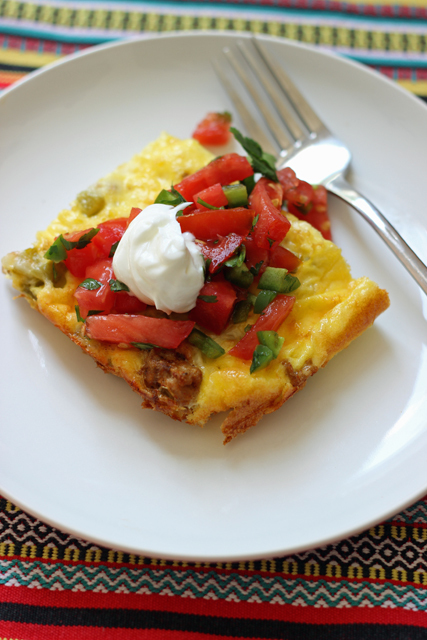 Spicy Turkey Egg Bake – My kids don’t like most egg casseroles, but they devoured this one. Chile Cheese Bake – I took my favorite Poblano Enchiladas and put them in casserole form. Cheater-style that is delicious. Chicken Enchilada Casserole – Don’t feel like rolling enchiladas? Then don’t. Toss it all in a baking dish and call it good. Which it is. Very. Homemade Corn Tortillas – FishPapa taught himself how to make these. He perfected his technique after a trip to Honduras in ’96. Now he and the girls make them for our family. Mexican Rice – My friend Elva taught me to make this rice in college. Twenty plus years later, I’m still making it. 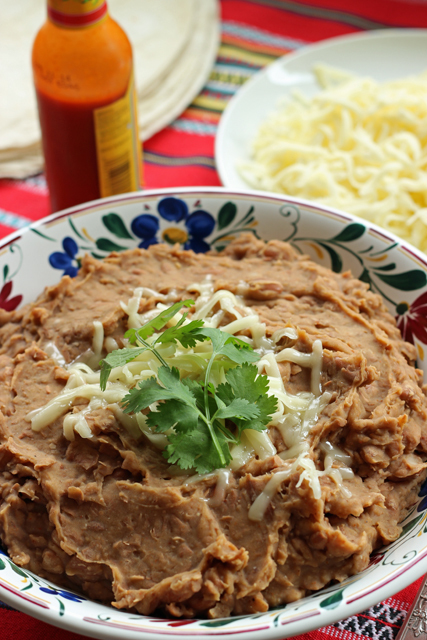 Healthier Refried Beans – These beans are so simple, and so much better than the can. Homemade Pintos – Make a ginormous batch of beans and freeze them in 2-cup portions. Then you can kick the can to the curb. Cactus Salsa – My mom’s friend Nancy shared this recipe with our family when I was little. It’s one of my favorites. Homemade Salsa – With a blender or food processor, you can whip up salsa in ten minutes or less. What are YOUR favorite Mexican-inspired dishes? 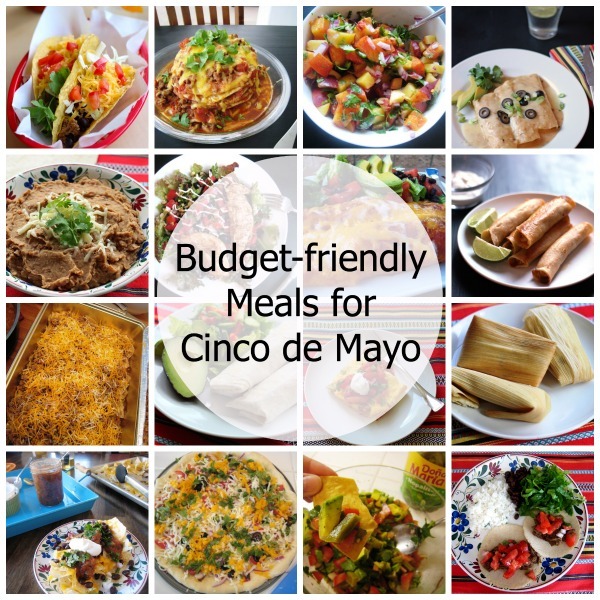 You know as I sat in bed last night looking at pinterest recipes after an evening of being ‘challenged’ by my 14yo son LOL, I was hit with the complete assurance that I must make a mexican feast for Mother’s Day [I host our families]. I won’t say that came from the place of ‘I don’t make enough mexican food because 14yo son doesn’t care for it’ but whatever it is – that’s what I’m going to do – thanks for the immediate inspiration today! Wow, this is an extensive collection of Mexican style dishes! 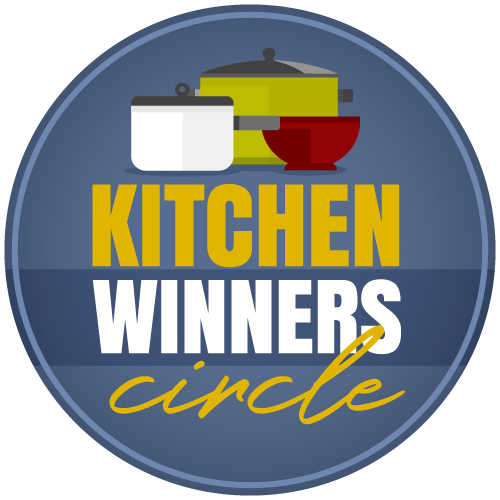 I have tried several of your recipes and my husband loved every one. I am inspired to try a few new ones. We have chicken fajitas about every 2 weeks. That is by far our favorite with all the fixins; guacamole, creamy salsa verde or black bean salsa. We also like taco pizza with a mix of refried beans and enchilada sauce as the base layer. We like a number of copycat recipes from an unmentionable fast food chain. 😉 NACHOS! ‘nough said lol! Now I’m in the mood for Mexican! Good thing we have leftovers from last night’s tacos for lunch. We LOVE your Mexican rice! It’s a regular thing on our menu rotation. I am inspired to try the poblano chili enchiladas this week. I noticed the sales on the Mexican food ingredients when I ran to the store yesterday. I think I’ll bookmark this page so I have a handy reference of these recipes. Thanks! Thanks for all the mexican recipes!! I was wondering if you ever make your own flour tortillas. My family loves them, but when I look at the package ingredient list, I think, “I can’t buy these anymore!” They are filled with preservatives and bad fats! Every single brand of them. My attempts to make my own have not gone over too well with my family. I can find corn tortillas with only three ingredients and I saw you posted a recipe, but my family doesn’t like them as well. What are your thoughts on flour tortillas? Have you ever attempted to make them? I have tried and not been satisfied with the results. We much prefer corn tortillas homemade, though. Trader Joe’s has an ingredient list that I like much better than others I’ve found. I need some help w/ the refried beans. Mine tend to get very dry if they aren’t consummed immediately. Should more water be left in the pot when mashing them? You can add water if it gets dry, either cooking liquid, or just plain water. That helps, especially on reheat.